They had some tough competition this weekend with six teams fighting for the top spot, and after Day 1 the team was in first going into the final competition. Blink came back for Day 2 and after performing a clean and solid routine, they held the top spot. The team showcased a variety of group stunts and fun transitions, all within a routine you have to see! Watch their Day 2 title winning performance! The theme for Blink this year is “This Is It.” The theme came from the song ‘This Is It’ by Seven Kingz and has much meaning to the team. Although Blink has had a successful season, they aren’t done yet! The team placed 5th at The Summit in 2018, and this year they’re pushing to do even better! The coaching duo, Marissa Aldridge and Sierra Jordan have been together all three years that Blink has been a team. Blink started as a Mini Prep team, then moved on to a Mini team and now Youth! 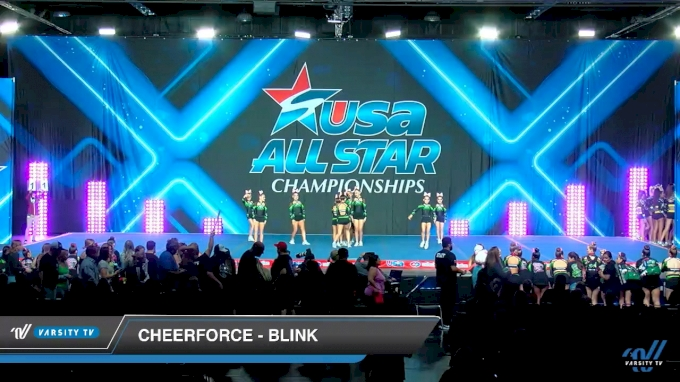 We can expect great things from CheerForce Blink, and we cannot wait to see them succeed in the future!